The Outlandish and the Ego by O. Ryan Hussain is political satire at its best. Two stories, one reality. The Aide will do anything it takes to stay in power and get his president re-elected and his appetite for victory is somewhat voracious – a bit of wife-swapping, slander, dubious partnerships and more. But he didn’t bank on having to beat The Brethren. Samuel and Roger, homeless vagrants, are on the run from demon gnomes. No one else can see them but the gnomes are making demands and Samuel and Roger must solve a riddle – “The Signal” – to satisfy them. Two plots twisting together as the fates of all three come crashing together. Oh my gosh! If your mind was in a good place to start with, The Outlandish and The Ego by O. Ryan Hussain is going to mess with it! This is a seriously funny book. Given the current political turmoil in one or two countries right now, it is so easy to draw parallels! I’m not normally a fan of satire or politics but this had me hooked and opened my eyes to yet another genre to add to my collection. It’s a little confusing to start with but hang in there; this is one roller-coaster ride you will want to get off just to catch your breath. The main characters were incredibly well developed and the two separate stories run side by side until they clash in one laugh-out-loud ending. You do need to have a certain sense of humor and be very open-minded to enjoy this and to appreciate just how clever it really is. Very well written, this is one of the most entertaining books I have ever had the pleasure to read. The Outlandish and the Ego by O. Ryan Hussain is a beautiful blend of comedy and satire, a story with strong religious and political underpinnings and one that captures the subtleties of the American reality. The Aide wants to keep his power and he can only do so by getting the president re-elected. What he will do to reach his goal will shock readers, including a dubious connection with a corporation that hungers for war, slander, and stabbings-in-the-back; a game of intrigue that unveils the nasty side of politics. But can he survive the evil secret society known as the Brethren? While the story of the Aide keeps readers engrossed, they will enjoy the suspense that is introduced with a subplot. Two homeless people — Samuel and Roger — are pursued by demon gnomes. The evil gnomes can’t be seen by others and for these men to satisfy the gnomes, they will have to solve the riddle of the “signal.” From the start, it is hard to imagine the connection between the three key characters in this story, but O. Ryan Hussain prepares wonderful surprises for readers. 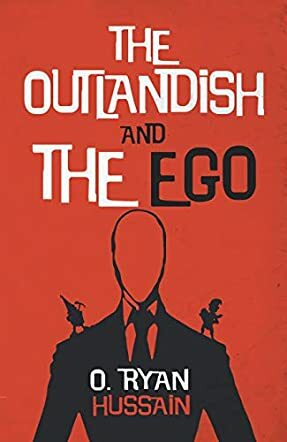 The Outlandish and the Ego might be a work of fiction, but it is filled with entertainment and explores the American culture of greed from a perspective that surprises readers. The characters are real and I enjoyed how they represent two sides of the American reality: the affluent and the extremely poor. It is also interesting that neither the poor nor the rich are free. The powerful are obsessed by the game of power and greed, while the poor have their own demons to deal with every day. This is an intelligently written novel filled with humor and has great potential to inspire reflection in readers while entertaining them. The Outlandish and the Ego by O. Ryan Hussain unravels in an insane asylum where inmate Samuel goes on a rampage and ultimately escapes to the outside world. He eventually teams up with the equally delusional Roger, as he continues to grapple with the Signal, and the gnomes that frequently hack his brain using shovels and pickaxes. In a surprising twist, the story continues in the White House where the president is confronted by an apparent attack staged by the Confederates. Briefed by his manipulative Aide in the Oval Office, the political crisis turns out to be a bizarre practical joke. The real challenge, in fact, is the existence of an evil secret society called the Brethren. What follows is a twisting plot line that ultimately climaxes in a way that is as hilarious as it is ominous. Witty, comical, brash and engaging, O. Ryan Hussain's The Outlandish and the Ego is a political erotica novel that is hard to put down. The characters are very comical to the point of being caricature-like and the two parallel plots are outlandishly laughable. It ceases to be funny, however, with the realization that it reflects the reality of the strife and division that currently plague the very real world of American politics. O. Ryan Hussain exaggerates and greedily makes fun of this reality but, at the same time, his work is a painful depiction of the absurdity and danger of the whole situation. Obviously influenced by Kurt Vonnegut's caustic literature, The Outlandish and the Ego not only entertains, it also delivers a timely and urgent reminder. The Outlandish and the Ego by O. Ryan Hussain is a novel filled with humor and drama and while it features elaborately developed characters and themes, it is a powerful indictment of the game of power that contemporary society witnesses. The Aide will do anything to position the president for reelection, afraid to lose his power. Follow his manipulative game as he engages in wife swapping, connives with a corporation that is willing to broker war, and a lot more. But can he survive a powerful sect poised to destroy him? There is a very interesting subplot that follows two derelicts, Samuel and Roger, pursued by demon gnomes that only they are aware of. Their own hope of survival is to solve a riddle. The suspense is strong and there is hilarity in the adventure. The humor fills every page of the narrative and the shift in the points of view as well as the plot lines makes for an interesting reading experience. From the start it feels like two stories but as the tension builds and the characters evolve, the stories take an unexpected twist and the connection is good. O. Ryan Hussain entertains readers enormously, succeeds in capturing their attention, but never fails to keep the writing real. I had the feeling that The Outlandish and the Ego is written by someone who understands the dirty side of politics and the quest for power more than anyone else. Although this is a humorous story, it is thought-provoking and filled with issues that reflect what takes place behind the closed doors of politicians. Hugely enjoyable. The Outlandish and the Ego is a work of comedy fiction penned by author O. Ryan Hussain. The novel is formed of two converging plot lines which combine to produce a surreal, wild, satirical and highly political story line whilst at the same time remaining totally bizarre in nature. We have Samuel and Roger, who are plagued by a pair of gnomes sending them mysteries to unveil, not least the elusive ‘signal’ they must decode, and then we have Aide, a politician determined to see his president re-elected. Aide’s life is filled with enough confusion already, with wife-swapping, secret societies and corporate wars, so when Samuel and Roger converge on it too, everything goes totally haywire. I think it is important to go into this wonderfully bizarre read with an open mind, and if you can do so then you will be rewarded by its strange twists and turns, but also the overall message and satirical view of modern politics which it delivers. It sometimes reminded me of The New Statesman television show, for its irreverence and weird underbelly of events that are actually not too far removed from the real facts and strange goings-on which we sometimes discover about high profile people. I really enjoyed the development of the three main characters as well as the villainous organization of the Brethren, and the snappy dialogue was a particular highlight for its charm and wit. Overall, author O. Ryan Hussain has done a superb job with The Outlandish and the Ego: developing intelligent and surreal satire for the modern age.